1. Lie down on the mat with a dumbbell in each hand, your arms up and the palms of your hands facing each other. 2. With your elbows slightly bent, lower your arms out to sides until you feel a stretch in your chest muscles. 3. Return to the starting position and repeat the movement. When doing the chest fly exercise, remember to lift your knees so that your back does not come up off the mat. 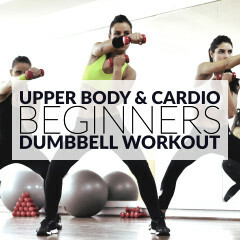 Breathe in as you lower your arms and breathe out as you lift the dumbbells back up. Keep your elbows slightly bent and your arms stationary throughout the entire movement. The movement should only occur at the shoulder joint. The chest fly is an exercise that targets the chest muscles. Women often avoid chest training, but neglecting your chest can create muscle imbalances in the body that can lead to bad posture, injuries and the inability to perform other exercises correctly. 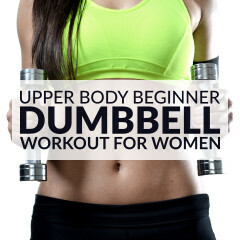 If you want a sculpted, beautiful and healthy body you need to work all muscle groups. Start with 2 sets of 10 repetitions and increase the number of sets and reps over time. 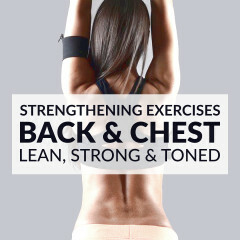 Women can do different exercises to train their chest area. Those exercises include the chest fly, push ups, chest press and pullover. You should try to do at least one or two chest exercises every time you do an upper body workout.